I. Introduction: Although some reports state that apple is only an incidental host, variegated leafroller (VLR) is the most important leafroller in central Virginia, where it largely replaces tufted apple bud moth. It can also be important in eastern New York and a few counties in West Virginia. Like TABM, resistance to organophosphorus insecticides in this species is increasing. VLR is similar in many respects to TABM, to which it is related. II. Hosts: This leafroller has been described as a general feeder, probably most common on low growing rosaceous hosts, e.g. strawberry. In addition to apple, it has also been found on azalea, blackberry, clover, cotton, Helianthus sp., maple, peach, raspberry, rose, sassafras, and other plants. III. Description: There is considerable sexual dimorphism in this species. Males are dark brown with a golden or cream colored band on the apical quarter of the wings (Plate 20). Females have several bands of varying shades of brown or reddish-brown on their wings. 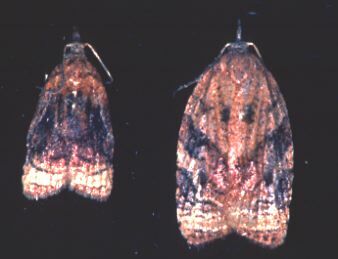 There is a pale patch near the base of the wings followed by a darker brown median stripe. The outer third of the wings is paler, but with a dark spot near the front edge of the wing. Wingspan of the female is 1/2-3/4 inch (14-19 mm), that of the male is ca. 1/2 inch (12-14 mm). First and second stage larvae are yellowish with a black head capsule, and are about 1/20 inch (1.2 mm) long. 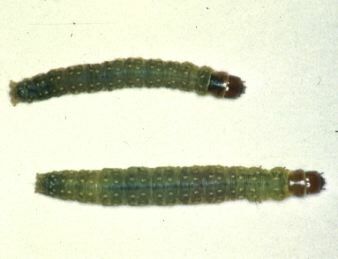 Older larvae are green with a light brown or amber head capsule; the sides of the body are lighter green than the top (Plate 21). The thoracic shield is deeper amber, with the color becoming more pale towards the edge. Larvae reach a length of about 3/4 inch (20 mm). Pupae are brown and may be found in folded leaves, either on the ground or hanging by the partially severed petiole. Pupae are about 4/10 inch long (9.3 mm for females, 9.1 mm for males). IV. Biology: This bivoltine (two generations) leafroller has a similar life history to TABM. 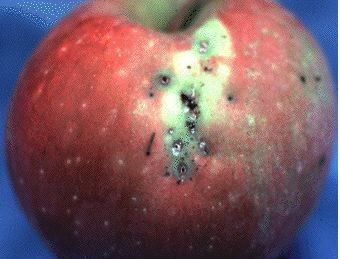 TABM is usually present to some degree in orchards where VLR predominates. However in such orchards, VLR usually has a stronger second flight, usually causing more injury than the first generation. Larvae of various ages overwinter in the ground cover, feeding on weeds (e.g. narrowleaf plantain, smartweed, dandelion, dock and others). VLR adults become active in the spring about 7-10 days later than TABM. Adults emerge from early May to mid-June in the first flight, and from mid-July to late August for the second flight. In some years there may be a partial third generation. Activity dates are shifted later in the northern part of the range. For example, first adult flight in Michigan is usually in late May. Eggs appear as flat green masses, of oval or irregular shape, usually containing 50-70 eggs. A typical egg mass is 1/10 x 3/10 inch (3x8 mm). Females lay an average of 5-6 egg masses. Eggs undergo a progression of color through olive-green, yellow-brown, and later with black head capsules visible in each egg in the mass. Eggs are deposited only on the top surfaces of leaves. Oviposition by the first generation starts about the first week of June, peaking in late June. The egg stage lasts about 13 days in the first generation. Egg hatch starts in mid-May, peaking in mid-June. Larvae require 20-42 days to reach pupation, averaging 35. The young larva cuts partially through the leaf petiole, causing the leaf to become less turgid. The leaf is then tied to another leaf, forming a protected area in which to feed. Occasionally the leaf is tied to a fruit, leading to the feeding injury of economic concern. Second generation oviposition starts in mid-July, peaking in late July and early August. The second generation egg stage lasts about 9 days, with about 50 eggs per mass. The second generation usually causes the most injury and can be important in the weeks approaching harvest. Although this species' ranges from Maine to North Carolina and west to Minnesota and Arizona, it is generally a southern species and not common above the 42nd Parallel in New York. However, it is also not common in the apple regions of North Carolina, which are higher in elevation. Larvae are parasitized by a variety of fly and wasp species, and are subject to infection by a virus (Plate 155). V. Injury: The injury cannot be distinguished from TABM There is some variability, but a shotgun pattern of isolated feeding sites is typical. VI. Monitoring: Pheromone traps are used. Hang traps about 6.5 feet (ca. 2 m) in height at petal fall. Monitor pheromone traps weekly. At peak flight start searching for egg masses. When masses are found, flag them in order to monitor egg development, and appearance of the black-head stage. Emphasize monitoring and control where VLR has been a problem in previous generations. Peak egg densities occur very soon after peak adult activity. No thresholds are available based on pheromone trap catch. A provisional economic threshold is 1% injured fruit at harvest. See also the materials listed for TABM. Provisional VLR DD timing: VLR has a higher developmental threshold than does TABM (VLR eggs 10.6C, larvae 8.6C, pupae 9.0C; TBM 9.7C, larveae 7.0C, pupae 8.5C). Also, VLR requires about 89% of the degree days to complete development relative to TBM (David et al. 1989). It is recommended to use a base of 50 degrees F for this species, with a DD target of 471 above the threshold (the target for TBM is 530 DD above 45F). Watch for refinements of this approach! David, P. J., R. L. Horsburgh & G. I. Holtzman. 1989. Development of Platynota flavedana and P. idaeusalis (Lepidoptera: Tortricidae) at constant temperatures in the laboratory. Environ. Entomol. 18: 15-18.